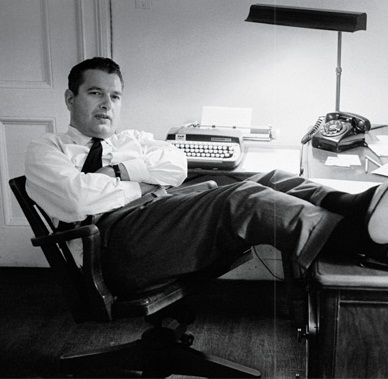 Students more accustomed to computer screens than manual typewriters are getting a chance to sit at author Joseph Heller's stained wooden desk and type on the battered Smith-Corona he used to compose his acclaimed novel Catch-22. A small exhibit at a University of South Carolina library displays the desk, typewriter and lamp used by Heller as he wrote many of his major works. The university library has one of the largest collections of his papers, manuscripts and other memorabilia available to researchers, library officials said. 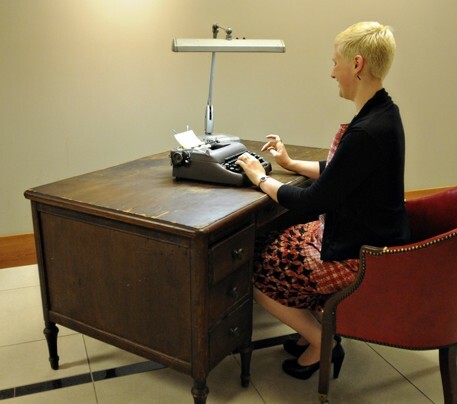 "We acquired this with the expectation that students would type on the typewriter and experience sitting at his desk," said Elizabeth Suddeth, director of the Irvin Department of Rare Books and Special Collections at the Ernest F. Hollings Library on the Columbia campus, where the display is located. The display is available for students and library visitors until late December, Suddeth said. 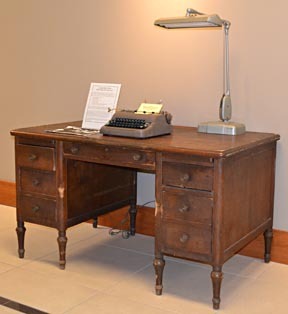 Heller died in 1999, and during the past year his widow, Valerie, added his desk and lamp to USC's collection, Suddeth said. Catch-22 was his first novel and is often hailed as one of America's best novels about World War II and questions of sanity, warfare and hypocrisy. 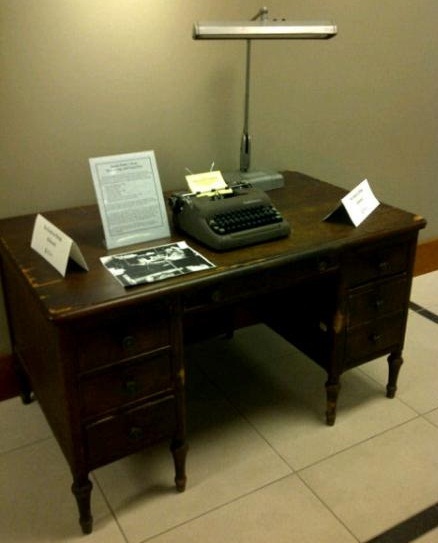 The typewriter was acquired in 2003 through the efforts of the late USC English professor Dr Matthew Bruccoli, who urged the university to buy a collection of Heller's manuscripts, and who also passed along many books from his own Heller collection, Suddeth said. The well-worn desk is covered with coffee cup rings and other stains. Its veneer is chipped, there's a hole in the right drawer, and it bears scars at knee height where chairs apparently bashed against it. 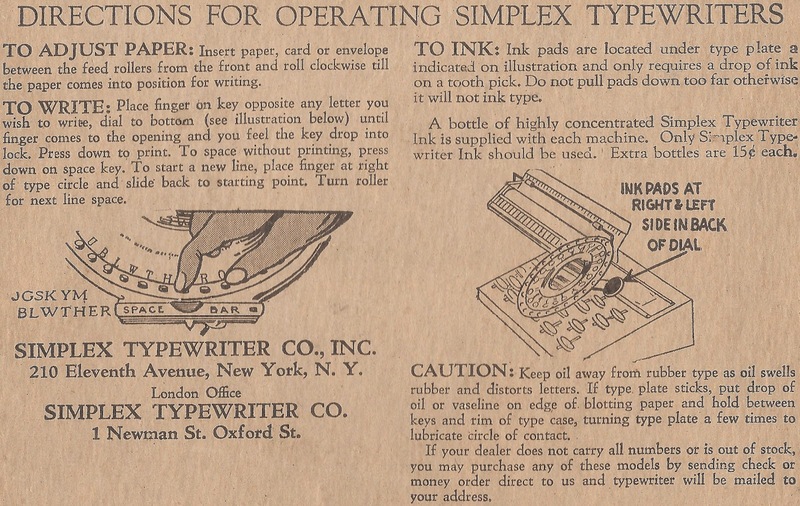 The small, portable typewriter has dark green keys that respond with a solid "thunk" when struck. Heller wrote in his autobiography Then and Now about acquiring the typewriter, which he bought at Macy's in New York. He ordered a special "writer's keyboard", which had punctuation marks in lower and upper case to make typing easier, he said. "It made no difference," he wrote. "It's very unfamiliar. 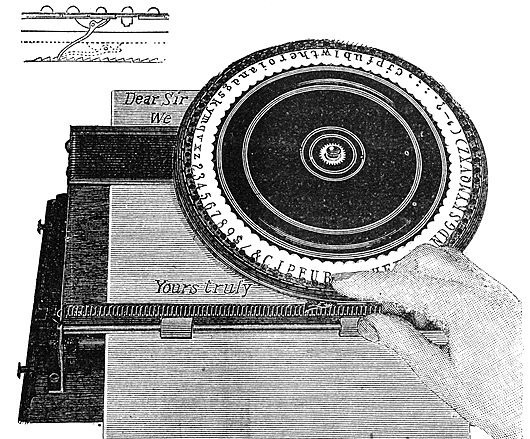 You don't hold your hands the same way as you would with a computer," said Jessica Dowd, 25, who tried the machine out after noting she'd never used a manual typewriter. "It's exciting to be able to touch what Heller touched," she said. The display reflects how Bruccoli wanted his students to learn about literature, said Dr Park Bucker, an associate professor of English at USC's Sumter campus. "He taught his classes in the library. He wanted students to be surrounded by writer's stuff. He was a very hands-on person and wanted a library to be a living collection," Bucker said. 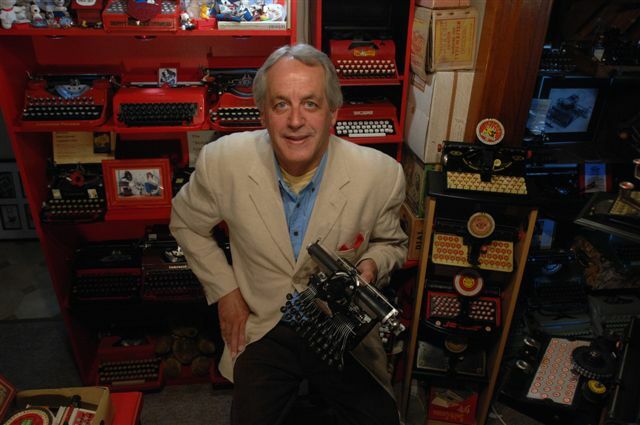 Bucker said his own students "think a typewriter is a museum piece. 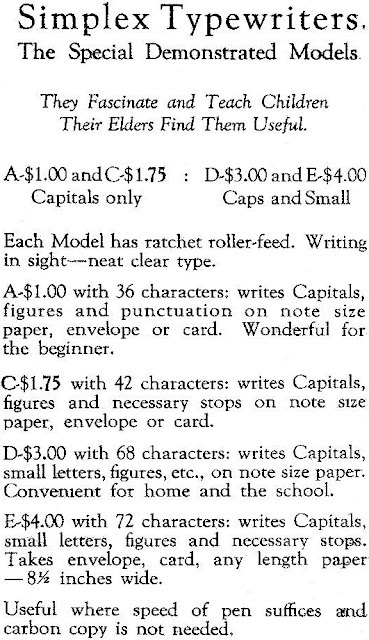 They need to know that writing was a completely different process before the computer." Bucker said some students enjoy Heller's dark humor in Catch-22, while others may find its "episodic nature" and changes of time frame frustrating. The professor said Bruccoli invited Heller to visit the University of South Carolina several times, where he took part in writer's workshops and delivered the main address at a university's celebration of F. Scott Fitzgerald in 1996. "Heller enjoyed his time here. That a big reason why we have his papers," Bucker said. The exhibit is on display through to December 20th in the Irvin Department of Rare Books and Special Collections section. The library is open from 8.30am to 5pm on weekdays on the Columbia campus. 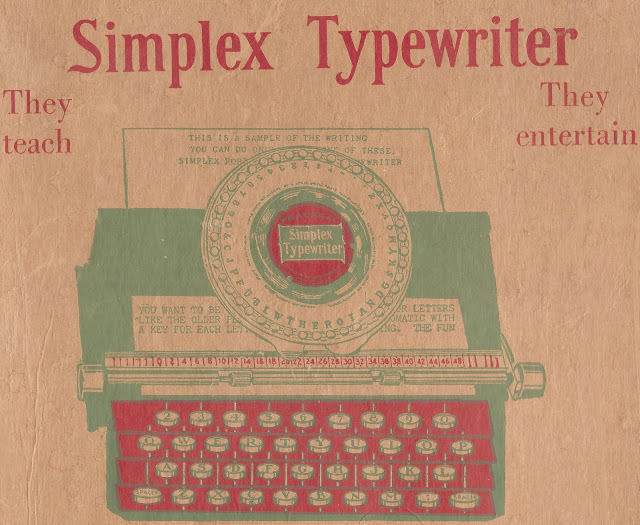 The Simplex Typewriter: Glorious Simplicity! 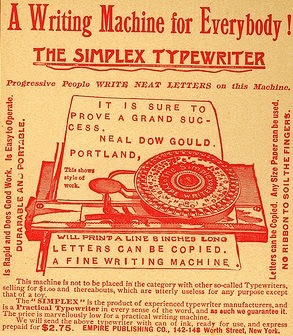 In 1893 George Canfield Blickensderfer wrote that the manufacture of typewriters had gotten far too complicated: he argued the simpler the machine, with the fewer moving parts, the better the typewriter. I’m not sure this could necessarily be said of some of his later models - the Blicks 7, 8 and 9 - but George’s word remains my gospel. At a time when Blickensderfer was perfecting his revolutionary Blick 5 in Stamford, Connecticut, in New York Analdo Myrtle English was having similar – though even more radical - thoughts about the simplicity of typewriters. 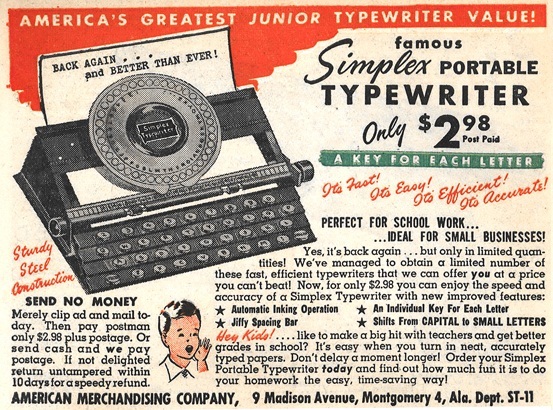 This, of course, became the famous Simplex, a typewriter that outlasted the Blickensderfer by more than half a century. 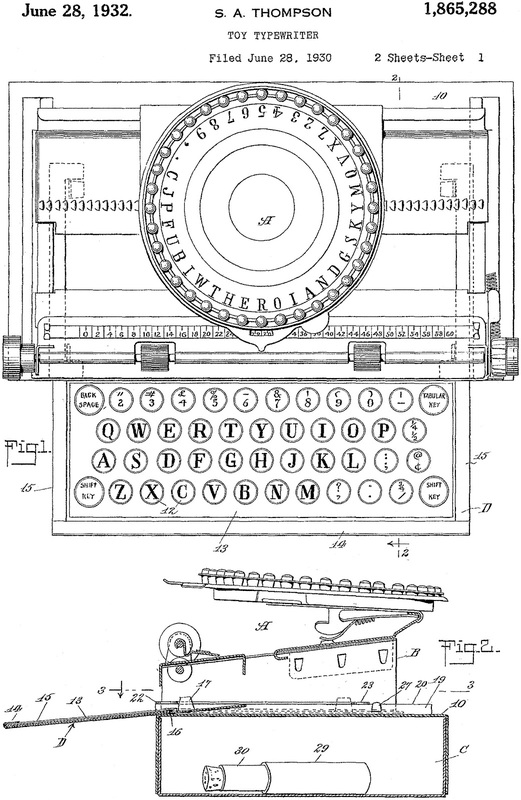 English’s patent was issued in 1892, and during the next 57 years, eight more patents would be granted for this most basic of all writing machines, the last six of them to Samuel Alexander Thompson. 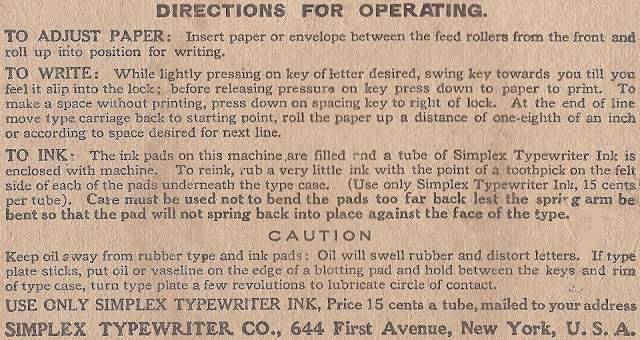 Next week we mark the anniversary of the last two of these being issued: 80 years ago, on June 28, 1932; and finally, on June 28, 1949 – at time when Thompson was 76 and still working on improving the Simplex. 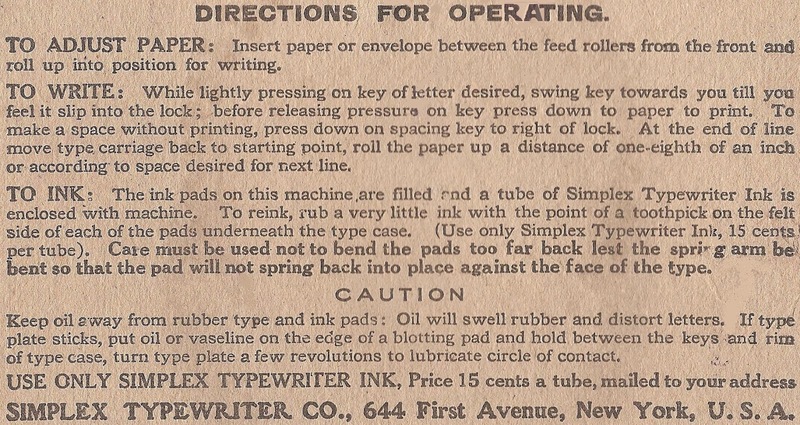 (This last patent was the only one assigned to the Simplex Typewriter Company, of New York). Samuel Alexander Thompson was born of Northern Irish parents in Grantham, Lincoln County, Ontario, on February 21, 1873. His elder brother, William James Thompson (born April, 1861) moved to the US in 1879 and 10 years later Samuel joined William and his American wife Hattie in Brooklyn, New York. William Thompson worked as a machinist, an occupation Samuel took up before becoming a lithographer. William became a manufacturer, and Samuel a typewriter manufacturer. 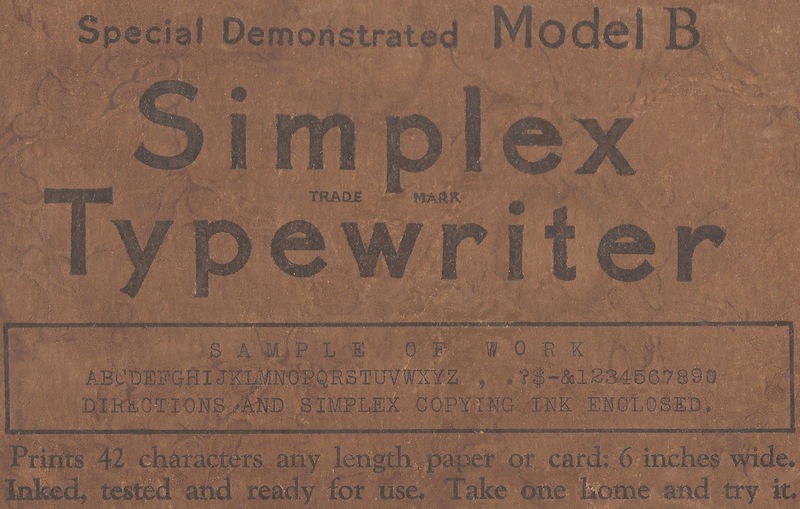 Analdo English’s original Simplex pattern was assigned to Philip Becker of Brooklyn. 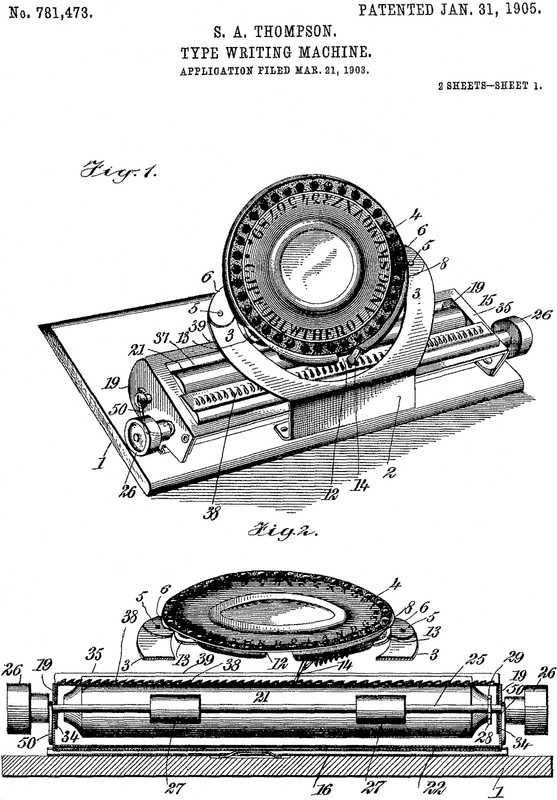 Seven years later, in 1899, Becker and William Thompson were jointly issued with a patent for an improved version of the same machine, as they were again in 1902. These first three patents for the Simplex subsequently became the property of Samuel Thompson. 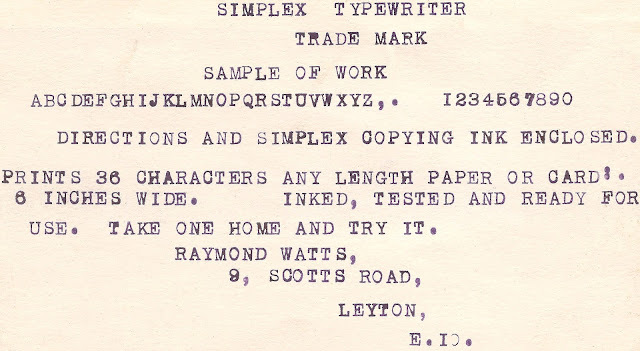 In 1903 Samuel Thompson applied for a patent for what is perhaps the most recognisable – and common - of the early Simplexes. 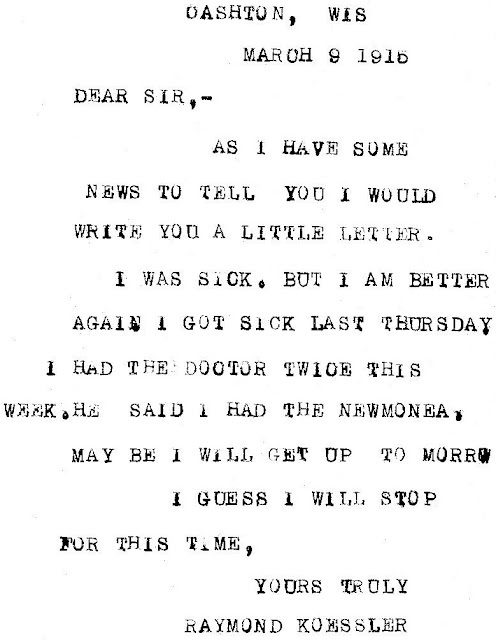 This was granted in 1905. 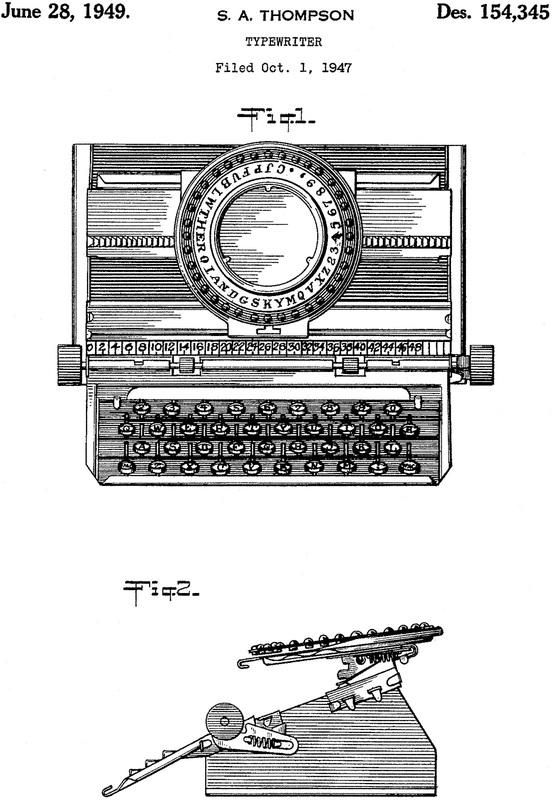 In 1915 Thompson was issued with another patent for the machine, and in 1924 a third one. for any purpose except that of a toy". 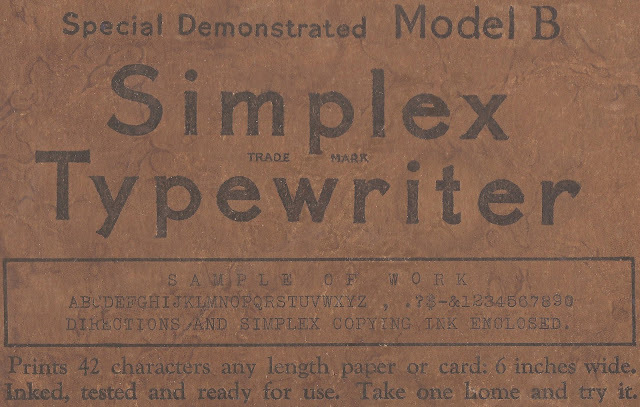 The original Simplex sold for $2.75. It stayed at that price for a very long time. 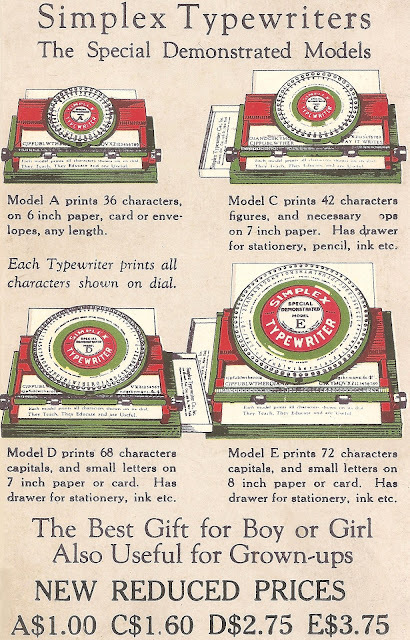 It was not until 1930 that Thompson, in applying for a fourth patent for the Simplex, referred to it for the first time as having “particular reference to a toy typewriter especially designed for children”. 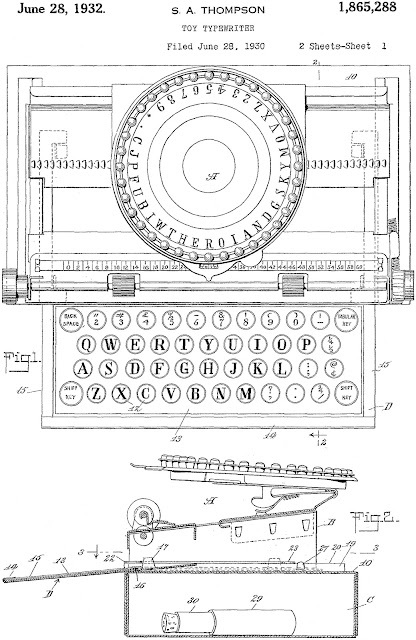 Interesting, in none of the previous five patents which had followed the original English design was there any reference to any of the preceding designs. 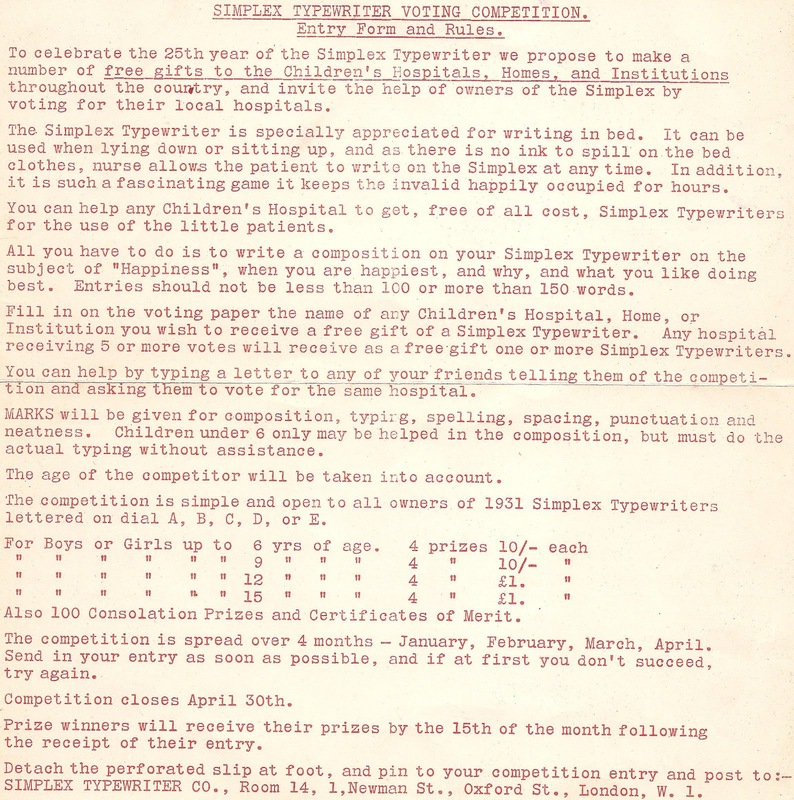 Yet in this 1930 application, Samuel Thompson referred to the Simplex as being “in the nature of an improvement over my prior United States Letters Patents Nos. 481,855, granted August 30, 1892; 621,628, granted March 21, 1899; 696,304, granted March 25, 1902; 781,473, granted January 31, 1905; 1,138,427, granted May 4, 1915; and 1,521,408, granted December 30, 1924”. 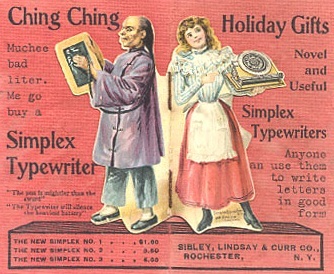 In other words, he was not only claiming English’s patent as his own, but those which had been issued to Becker and to his brother, William Thompson. 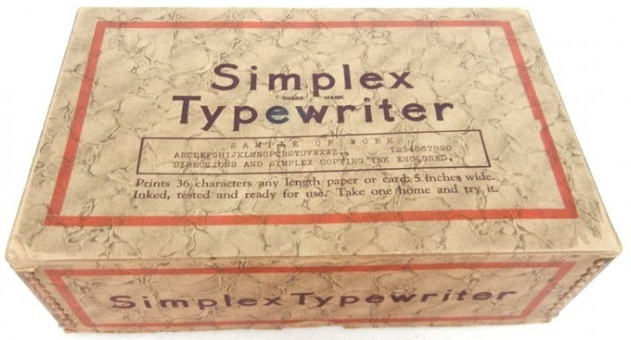 This fourth patent in Samuel Thompson’s own name was issued in 1932 and was quickly followed by a patent for a “combined box and receptacle for toy typewriters and the like”. 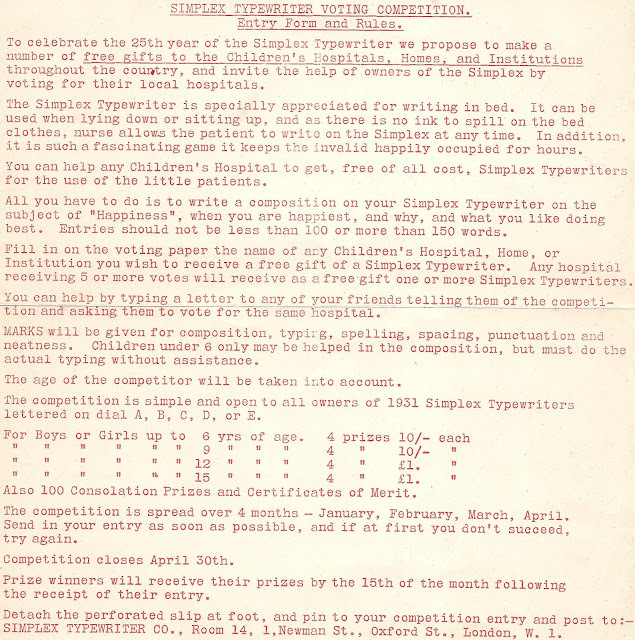 Only in his last patent, applied for in 1947, did Thompson refer to any other type of toy typewriters, and these were Marx products designed by Samuel Israel Berger and Raymond Lohr respectively, both of which have been covered elsewhere on this blog. 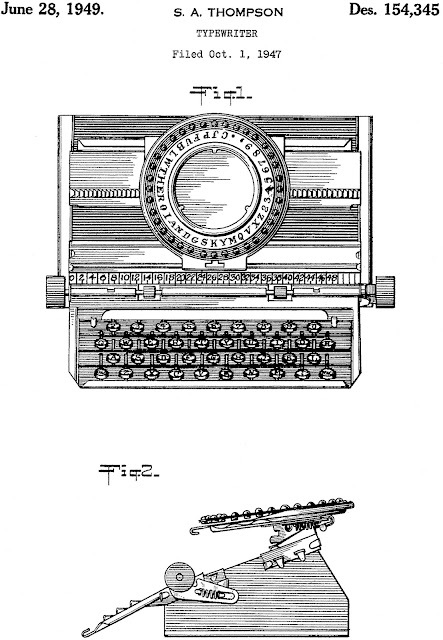 Thompson borrowed the tiered keyboard idea from both. Lohr, by the way, was educated at Xavier University, Cincinnati, where Richard Polt is now a professor of philosophy. Is this the first Typecast? 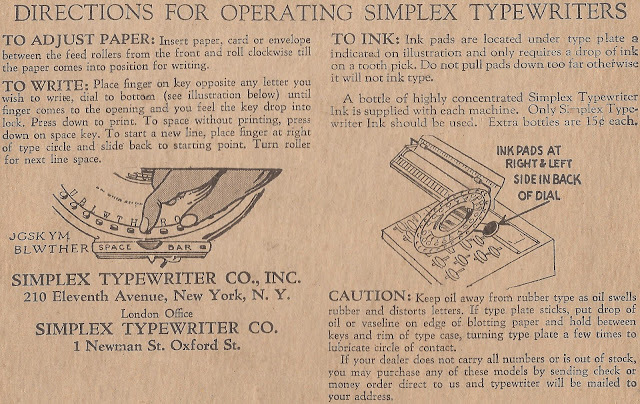 Newton's Fourth Law: Irresistible Typewriters!